I love my little buddy. I felt alone and sad and wanted a dog to give me unconditional love. 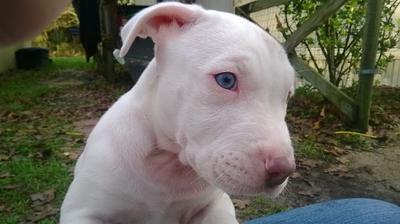 Someone was giving away a Pit Bull puppy and I decided I wanted him. 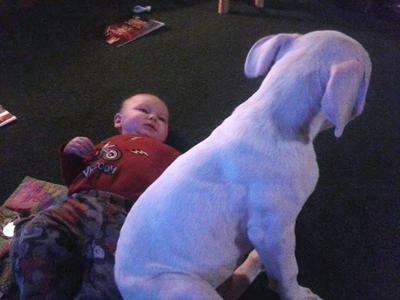 (My son has a pit bull and he is sooooo loving). I have no clue (yet) how old he is, or what type, but he sure has made me a happier person. He cuddles up with me every night, loves to give kisses, and out of all the dogs I have had, was the easiest one to be housebroken. I wouldn't not give him up for anything. He is a happy little puppy and made me a happier person. I just love him to death. He's just beautiful. May you have many happy years together. Love him and he WILL love you for life . THANK YOU from one pit bull lover to another. The solid white is amazing ! My pit PEANUT is a brintle fawn. I adopted him at 3 months from a kill shelter, He was SO SICK. He will be 6 years old March. Hugs and kisses to TOBY ! 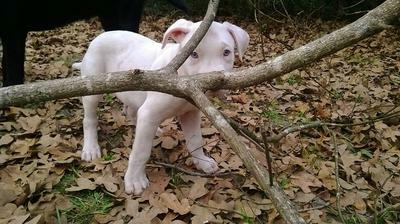 Must be a Texas pit thing with oversized sticks. 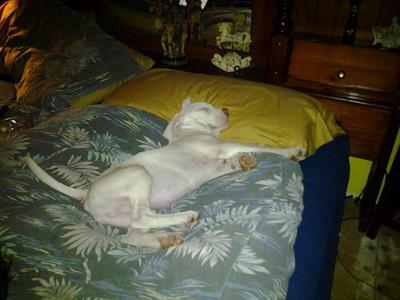 I have a white pit that I got in Denton. We also have a picture of him with a huge oversized stick he is dragging around our yard. We really appreciate all the comments. I am sure Toby and I will have an awesome life together, and I hope a long one.